There are plenty of evocative elements embedded in Fading Light I and Fading Light II. These are not works that can be passed over quickly, merely glanced at. They require looking. And processing. Above all, they require time. First, one notices the medium: aged paper. The patina of age reveals itself in the yellowing, browning, discoloring surfaces. Texture provides another clue. The collaged pieces vary subtly from smooth to worn to ragged. This is not just any paper; it has the unmistakably pulpy fibrous appearance of pages torn or cut from a book. And these are not just the pages–each collage is formed from the endpapers, covers, and spines of books as well. These are the parts of books not normally put on display or appreciated for their aesthetic qualities. One can identify here a patch of hardened glue and the impression of now-missing pages and thread. Each part once constructed a cohesive whole of a very different type. The absence of one particular element is equally conspicuous. These paper collages are devoid of that which typically makes books what they are–text, words, ink on paper. In many ways this absence is apt, because the book itself is not important for Fraser. Although the artist acknowledges that “many of the components come with a history,” for Fraser, meaning ultimately comes from shapes and form, structure and surface. The process of invested looking for the subtle nuances of Fading Light I and Fading Light II is a process mirrored by the works’ construction. Fraser describes his selection process as an “act of love and labor.” Guided by sight, touch, and intuition, he handles the materials in a way that evokes both romantic and architectural notions about creating art. He chooses the pieces for their physical properties. In part this selection criteria is based on practical reasoning; the paper must be durable enough to survive the collage process and to emerge as part of a new whole. But Fraser’s process is also based on more abstract principles of feeling and instinct. The methodology of construction is transparent. 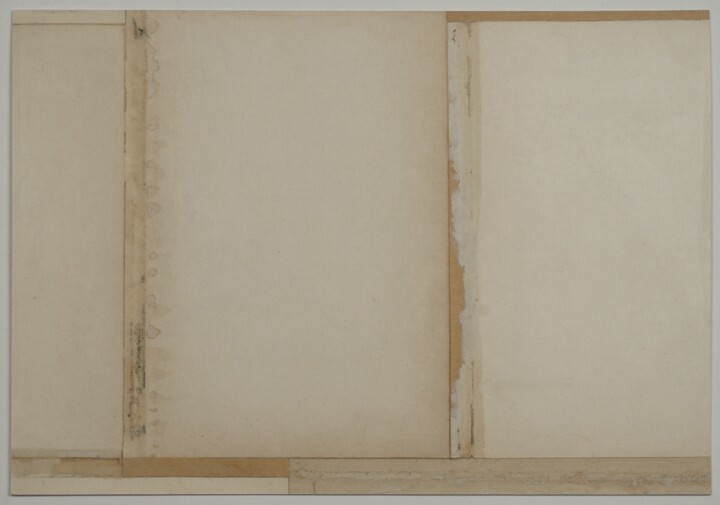 Looking at the collages, it is possible for one to determine how the systematic yet conscientious layering of paper on paper achieved novel forms. This concept of architectural construction, the “builder’s logic,”1 gives these works a sense of duality, as they are simultaneously two- and three-dimensional. Fraser uses the phrase “shallow relief”2 to characterize this double element. 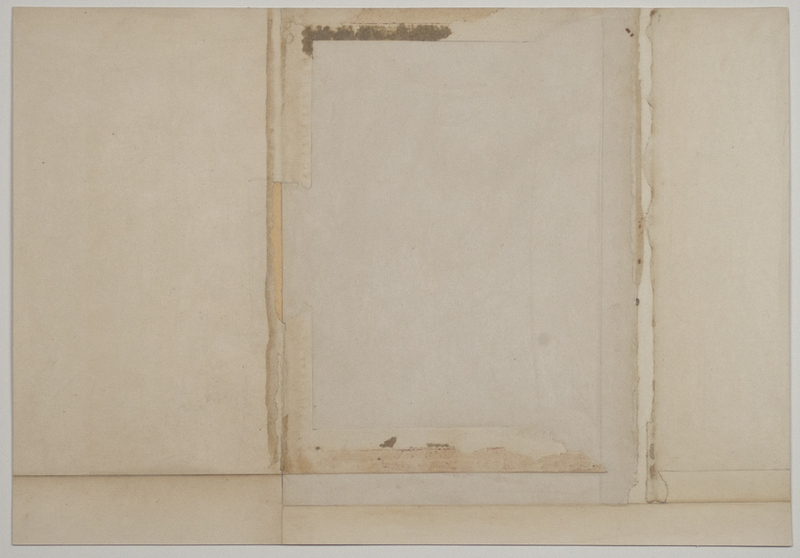 It is exactly this quality that gives these works their sense of tactility and texture. Although the range of color is narrow, the variation of surfaces gives each overall work a complexity and depth that enhances its visual effect. Fraser believes art should make demands of its audience. The time invested in carefully constructing these collages is echoed in the object’s expectations of the viewer. The titles of these works, Fading Light I and Fading Light II, also reflect this sense of exchange and interaction. They refer to the relationship between interior and exterior, like a window looking out over or into another space. From a purely compositional standpoint, these collages evoke this window through their very form. On a deeper level, the paper acts as a transparent barrier between the viewer and the powerful nuance, subtlety, and beauty of the art. In the words of the artist, “My intent is to arrest a potential viewer, and provide a singular experience, an exchange, a slow passage of time.”3 With their understated allure, Fading Light I and Fading Light II each offer a shared moment, an intimate experience, and a meditation on the capacity of art to change our worldview. 1. John Fraser quoted by Polly Ullrich, “Mapping the Contemporary Sublime” in Restraining Order: John Fraser, Work in Mixed Media, 1991-2010 (Chicago: John Fraser, 2010), 10. John Fraser (b. 1952, Chicago, IL) earned his BA from Roosevelt University, Chicago (1975), and his MFA from Northern Illinois University, Dekalb, Illinois (1989). A survey of Fraser’s work was organized at St. John’s University, St. Joseph, Minnesota (2004). Fraser has been a visiting artist at numerous universities, including the Brigham Young University, Provo, Utah (2008), and Grinnell College, Iowa (2009), and he was in residence at Yaddo, Saratoga Springs, New York (2010). Recent solo exhibitions have been held at Scott White Contemporary Art, San Diego (2011); Roy Boyd Gallery, Chicago (2008, 2010, 2012, 2013); William Campbell Contemporary Art, Fort Worth, Texas (2012); Toronto Image Works, Toronto, Ontario (2014); and The Rangefinder Gallery, Chicago (2014). His work has been included in many museum exhibitions, including at the Museo de Arte Contemporáneo Esteban Vicente, Segovia, Spain (2009); the Lancaster Museum of Art, Pennsylvania (2010); the University of Alberta Museums, Edmonton, Canada (2010); the Katonah Museum of Art, Katonah, New York (2011, 2013); QuadrART, Dornbirn, Austria (2012); McNay Art Museum, San Antonio, Texas (2013); Pavel Zoubok Gallery, New York (2013); Cedarhurst Center for the Arts, Mt. Vernon, Illinois (2013); Foster Art Center, Austin College, Texas (2014); and Columbus Museum, Columbus, Georgia (2014). Fraser received Artist Project Grants from the Illinois Arts Council (2011, 2014). Fraser lives and works in St. Charles, Illinois. More information about his work can be found at www.johnfraserstudio.com. Sarah Zabrodski (b. 1985, Calgary, Alberta, Canada) holds an MA in Art History from the Institute of Fine Arts, New York University. She works in the Publications Department of the Getty Research Institute, Los Angeles. Zabrodski blogs at emergingartcritic.com. John Fraser quoted by Polly Ullrich, “Mapping the Contemporary Sublime” in Restraining Order: John Fraser, Work in Mixed Media, 1991-2010 (Chicago: John Fraser, 2010), 10.